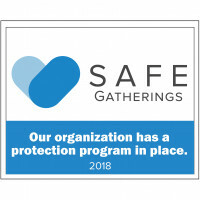 Last week, Safe Gatherings mailed out window clings to organizations that are committed to protecting the vulnerable by screening and training those who work with vulnerable populations. The churches and organizations that received the window clings have met the criteria for our first recognition program, which is a certain number or percentage of active Safe Gatherings approvals. If you received window clings, let us see how you are posting them for parents, caregivers, congregants and the community to see! If you did not receive recognition this time, please know that we will be continuing this program in 2019 and look forward to recognizing many more churches and organizations. Together, we can make the message stick!